Whatever your taste you’ll find something on the Festival site to satisfy your appetite or quench your thirst. Whether you would like a three-course meal, a light lunch or a sandwich, the restaurants and Festival Food Hall offer a huge range. Choose from freshly baked pizza, pasta and venison or beef burgers to sandwiches, baguettes, falafels and more. Vegetarian, vegan and gluten-free options are, of course, available. As always, Shepherds will be serving their locally made sheep’s milk ice creams – perfect in any weather. This year we have a new addition – the Family Food Hall is the perfect space for families, with food catered specifically to children’s tastes. The area includes an enclosed garden and additional seating as well as some children’s games. It’s an opportunity for parents to relax and for children to enjoy themselves in a dedicated, intimate setting. There will be baby-changing facilities available here too. For a pint of real ale, a glass of wine, Prosecco, or a jug of Pimm’s to enjoy in the sunshine, head to the Festival Bar with its extended outdoor decked area and soak up some of the Festival atmosphere. The café is open early for your first shot of coffee through to the call for last orders. Join your friends or make new ones here. There will be a deposit scheme for reusable coffee/tea cups and beer/wine glasses across the Festival site. A £1 deposit will be collected at point of sale for each coffee/tea cup or beer/wine glass served. Once your drink is finished, you can get your £1 back at one of our 3 Cup Return Points on site. The cups will be washed and used again and again… Alternatively, bring your own cup and get a discount when you buy hot drinks at all Coffee Cart outlets. 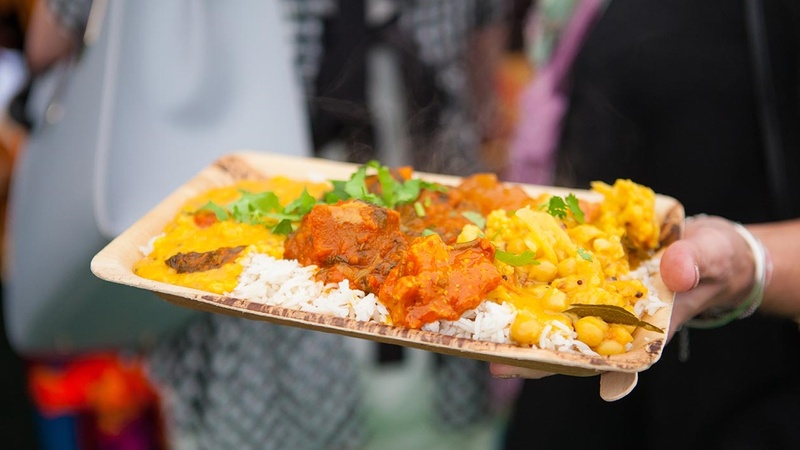 Gloucestershire-based Big Event Catering bring their vibrant, quality dining venue The Grove to Hay Festival 2019. They will be providing delicious and imaginative dishes using the freshest local, seasonal ingredients. The menu will include dishes made with local meats, fresh West Country fish and locally sourced seasonal vegetables as well as flavoursome vegan and gluten-free options. A selection of daily special dishes will also be on rotation throughout the Festival. Their fully stocked bar will feature craft beers, artisan gins, local ciders and carefully selected wines to complement each visitor’s choice of food. The coffee shop will also offer afternoon teas, fresh organic juices and smoothies, speciality coffee, a large selection of teas and hot chocolate, as well as homemade cakes, biscuits and delicious savoury snacks. Bookings are recommended for the restaurant, and walk-ins are also most welcome. Book a ‘Ticket to Dine’ and receive a complimentary drink on arrival. Online booking will be open soon, or call the Box Office on 01497 822 629. For general bookings call 01453 708 336 or email thegrove@bigeventcatering.co.uk. If you are looking for irresistible ice creams, sublime sundaes and toppings, you’re in the right place. Shepherds have been making artisan ice cream since 1987, using a unique recipe based on sheep’s milk. Visit their stall on site and their café/ice cream parlour at 9 High Town, Hay, chosen by Condé Nast Traveller as ‘one of the world’s best local ice cream shops’. Follow them on Facebook or Twitter @shepherdsices. Don’t be a lost sheep – flock to Shepherds. Fresh home-made, stone-baked pizza using the best local ingredients, with a unique dough recipe and cooked to order. Open every day till late. Home-made and traditional crêpes and galettes. Sweet and savoury gluten-, wheat-, dairy-free and vegan options. La Bonne Crêpe use local, seasonal, organic, Fairtrade ingredients and operate a strong environmental policy. They are able to feed carnivores, vegetarians, vegans and anyone with an insatiable sweet tooth from breakfast to late at night, sharing an authentic taste of France. This Cardiff-based Greek Cypriot family are passionate about sharing their authentic Souvlaki fresh from the skewer. Greeks don’t do anything by halves, especially food, and Meat & Greek are proud of the fact that their portions are generous and their ingredients wholesome. All of their food is cooked to perfection over charcoal. So what is Souvlaki? Think toasted pitta breads packed with hand-cut cubes of charcoaled chicken or pork, market-fresh salad, topped with a helping of home-made tzatziki or houmous and garnished with parsley and onion – delicious! If meat isn’t your thing, just swap it for charcoaled halloumi and get stuck in – Opa! Old Granary Pierogi were Street Food/Takeaway category finalists in the BBC Food and Farming Awards 2018. The business has developed from a passion for cooking and eating good, wholesome food, and is run by a Polish family that has chosen to settle in rural Herefordshire, embracing British cuisine and infusing it with their Polish culinary heritage. Pierogi is a traditional, hearty dish that resembles Italian ravioli when boiled, or the traditional Cornish pasty when baked. Pierogi ‘dumplings’ are the most famous Polish food, known and loved all over the world and becoming more popular here in the UK too. The baked pierogi are hand-crafted in yeast dough cases, hand-rolled and stuffed with meaty and vegetarian fillings. Along with both types of pierogi, Old Granary Pierogi also serve other Polish dishes including Bigos (hunter’s stew), beef goulash and soups – all in traditional Polish bread bowls – and also a Polish sausage with sauerkraut. Vegetarian, vegan and gluten-free options are available. All of Squid Inc.’s fish is British, wild and sustainably caught. Their Crispy Salt & Pepper Baby Squid is available in three flavours, and they cut and triple-cook their own chips on site. Their menu objective is for their food to be of very high quality and at the same time environmentally friendly. The squid is lightly battered and fried quickly in hot oil, and they use baby squid as they are extremely tender and light – with absolutely none of the ‘rubberiness’ you can often get with fried squid. Each portion is seasoned with sea salt and Vietnamese Phu Quoc pepper. Phu Quoc pepper is considered by many to be the best in the world and Squid Inc. toasts theirs each day, which gives a warm, sweet and unique flavour. The Beefy Boys have a huge passion for American-style BBQ and burgers. They grill using 100% Herefordshire beef: no eggs, fillers or breadcrumbs are in their burgers. Their meat is never frozen; they cook fresh to order from their core menu, and customers can also tailor their orders by taking out or adding in ingredients to cater to dietary requirements. Their buns are baked fresh every day by award-winning local baker Peter Cook of Hereford, using locally sourced ingredients. The Beefy Boys stall has been designed so that customers can watch the cooking/grilling process and speak to staff, asking any questions as you go, as in their Hereford restaurant, where the kitchen is on view to diners. This is a small, family-run company from Wales producing home-made vegan and gluten-free dishes. Try the vegan crispy fritters served with ruby red spicy slaw and home-made chilli jam. Passionate about running their operation as ethically as possible, The Fritter Shack are winners of the ‘Glastonbury Sustainable Trader Gold Award 2017’ and the ‘Hay Festival Most Sustainable Trader 2018’. This year Soulfood Kitchen returns to Hay with even more delicious fare. To the duck confit and array of cakes that wowed the Festival last year, this year they add smoked tofu and smoked halloumi burgers and wraps for vegans and vegetarians, plus smoked chicken burgers, wraps and salads. This year a percentage of their takings will go to a Syrian orphanage – speak to staff on the stand if you’d like to donate. The Teifi Toastie Co. is a gourmet street food stall based in Mid Wales. They love using local produce to create mouth-wateringly good, grilled cheese toasties. Their sourdough bread is sourced from local craft bakeries and all their organic cheeses are supplied by Welsh producers. Welsh halloumi, home-made rose harissa, sliced tomato and honey, pakoras and samosas (and tamarind sauce) are available throughout the day. Or try their authentic Thali plate for a more substantial meal, with two contrasting curries, dahl, the finest basmati rice and chutneys. Savour and enjoy their food, the country air and the Hay Festival experience. The Spanish Buffet are paella cooks and they are proud to bring a typical recipe from Valencia to Wales, to give a taste of their culinary skills to palates over here. They hope you enjoy Mediterranean food as much as they enjoy cooking for you. Welsh Venison is a local farming family, butcher and farm shop. It offers festival-goers the healthy venison option and will be open every day with a varied menu including its famous gourmet venison burgers, chilli, meatballs, salads and wedges. For the early birds, the free-range egg and bacon rolls are a great way to start the day. The family’s farm shop, stocked with Welsh produce, local bread and gifts for the home, is also worth a visit: www.beaconsfarmshop.co.uk. Yellow Turban Thali offer home-made, healthy, vegan, tasty curries, using the best ingredients and home-roasted spices for an authentic flavour. They are continually improving their sustainability and their recipes to give the customer a healthy, tasty experience. This year they hope to be trialling a new pakora recipe and will be making it on site. The Vietnamese eatery Bittenclub like to combine the vibrant, zingy flavours of Vietnam with the robust, gutsy origins of classic French ingredients. They create delicious baguettes, noodle salads and jasmine rice bowls filled with marinated crunchy raw vegetables, home-made zingy sauces and fresh herbs. For breakfast, indulge in French toast with pecans and cinnamon or an invigorating broth and rolled omelette. El Food Brothers was established in 2018 by two childhood friends who shared a passion for all things delicious. This fraternal duo will be serving up a range of experimental tacos such as cheeseburger, beef brisket rendang and refried bean and avocado, plus their signature Girl Scout cookies. For more info check out their Instagram @efbrothers. Lilo’s Pasta is an independent Welsh company serving unique and exquisite pasta dishes, with options also available for vegans and vegetarians. Using their own recipe sauces, they provide fresh pasta dishes cooked to order for each individual. The Good Slice is a social enterprise with a simple message: eat pizza, end hunger. Every pizza you buy provides a meal to someone in need. They have provided 5,000 meals to the children of Well-Wishes Nursery, Malawi. Closer to home, they work with Glass Door Homeless Charity. Their wood-fired pizza is topped with seasonal, sustainable, locally sourced produce. And the founders are from Monmouth. Original and unique hand-crafted, plant-based cuisine from Wales. The Parsnipship makes unique and original vegetarian and vegan food. At the heart of the company is a passion for creating innovative products and commitment to sustainable business practices. Experience mouth-watering Spanish and Mexican artisan street food made with the finest, fresh, local ingredients. Their aromatic and delicious signature dishes of smoked Mexican vegan beans and chorizo chicken medley will please all palates, appetites and dietary requirements. Children’s wrap selection will include tuna mayo, cheese, ham, coleslaw, salad and olives…you choose…we fill…it’s a wrap!